"Luck has defied justifiable doubts about his ability to play effectively by turning bits-and-pieces receivers - Dontrelle Inman, Chester Rogers, Zach Pascal, Mo Alie-Cox, these are not star names - into contributors on the Indianapolis offence this season." Indianapolis may have lucked out this offseason - and for more reasons than just their puntastic quarterback's return. 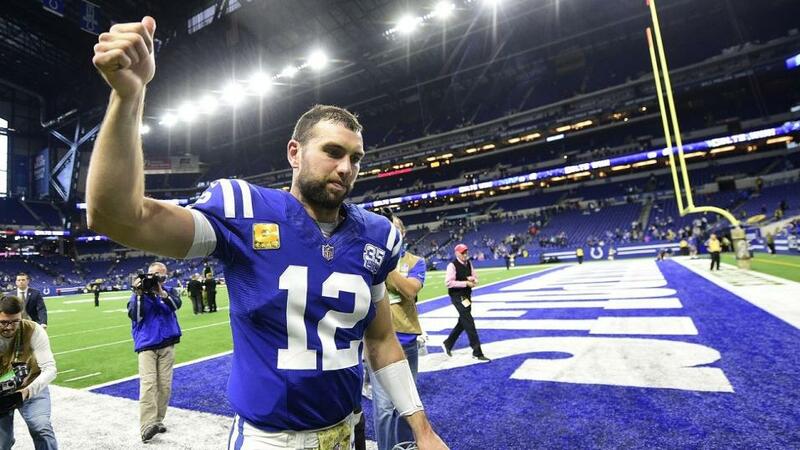 Obviously, they got Andrew Luck healthy, though there was nothing inevitable about him returning and playing as well as he has, or playing at all in fact, given the lengthy layoff and protracted delays he's faced in the last two years. But fortune has finally smiled on the Stanford product. 29 years old now, ring-less, and long-afflicted by piecemeal offensive lines who turned to paste against any pass rush, Luck has defied justifiable doubts about his ability to play effectively by turning bits-and-pieces receivers - Dontrelle Inman, Chester Rogers, Zach Pascal, Mo Alie-Cox, these are not star names - into contributors on the Indianapolis offence this season. This is what the best QBs do. They make the best of what they have and lift the play of those around them. But Luck couldn't do it witout an improved offensive-line. They haven't given up a sack in four straight games. That's a franchise record and the fifth longest run in NFL history. Anthony Castonzo is master of his domain at offensive tackle, and rookie guard Quenton Nelson is already paying back the first round draft capital GM Chris Ballard spent on him. Perhaps the biggest break they get though was New England OC Josh McDaniels welshing on his agreement to become head coach hours before his first press conference at Lucas Oil Stadium. Caught out by his sudden about face, they called in former Bills QB and then Eagles OC Frank Reich and, right now, it looks like they may have hit on the perfect appointment by virtue of McDaniel's cold feet. Reich's designed the offence to move the ball quickly. It's helping Luck avoid hits and making things easier for the line. His clever play designs are getting receivers open, with the QB hitting 15 different players so far this this season. Their defence was showing signs of life through the opening weeks too, rookie Darius Leonard making a huge impact, but has tailed off recently - they allowed the Jet post 42 points four weeks ago. That'll have to improve if they're to really compete, but any sign of progress is encouraging for a unit that's been historically embarrassing. The Titans have enjoyed a similar boost from their new coach. They stopped taking the mick with Mike Mularkey's "exotic smashmouth" and brought in former Patriots linebacker Mike Vrabel to move things into the 21st century. It hasn't been all smooth though. Corey Davis has just two games with over 62 yards and only grabbed his second TD of the season last week. They've ground out several impressive wins - Eagles, at Jags, at Cowboys by 14 points and then, most striking of all, the Patriots beatdown last week - but they're sandwiched by some rough results. Miami in the opening week, Buffalo, and a 21-0 loss in their own stadium to the Ravens. These poor results are partly down to Marcus Mariota's health. He was playing injured earlier in the year, but now looks to be back in shape and is a lot more of a threat, both passing and running. Their 5-4 record is founded on defence though. They've not allowed more than 23 points in eight straight games. Defensive teams look incresingly hard to rely on week-to-week in the more offensive NFL, but the Titans aren't resting on their reputation and keep offences guessing with their scheming. They'll need to be on their toes against Andrew Luck the way he's playing. As reflected by the line, this is a very even contest. What we're looking for is a spot advantage, and this has the look of a comedown game for the visitors after their huge win last week over the Pats last week. The Colts have shown themselves capable of putting up points on good defences. The Titans may pose more problems than others for Luck, but offences get so many breaks now with new rules and protection for QBs, and the Indy line is playing so well, relying on a defence to win this game for you does not appeal. I would take the Colts -1 at home at [1.9]. On the 49 point total, I'd look at the over for the same reasons. Luck's been making the proverbial silk purse from a sow's ear, and can do it again here. If the Colts get near 30 points, as they've regularly done, Tennessee will have to chase them. If we expect scores a TD play might be worthwhile, and if we expect Indy to do most of it, it makes sense to look at their weapons. TY Hilton and Eric Ebron both look good at shorter prices, but I prefer a longer odds play - it paid off last week on Drew Brees at 11/1, though we won't talk about the handicap line there - so Jack Doyle, two games back from injury, stands out. Luck loves his tight ends, with four different ones collecting 70 receptions this season so far. Ebron has the bulk of them, but there'll be more of split now Doyle is fit. He only had three target last week, but made all three catches, and went 6-for-7, 70 yards and a TD versus the Raiders the game before. He's 9/2 in the Any Time market. I'm very tempted by him in both First and Last TD markets too at 22/1 and 25/1 so would have a small taste at both those big numbers too.